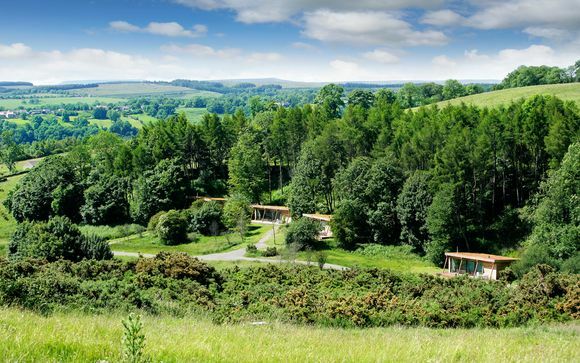 Set apart from the town of Richmond, which is only a beautiful stroll away along the Coast to Coast path, the delightfully secluded Natural Retreats site is the perfect location for those wishing to enjoy a full holiday, or short weekend break in luxurious self catering accommodation near Swale Dale. Plenty of family attractions are situated locally, including educational places like Darlington Railway museum, housed in one of the oldest railway stations and the great Castle of Richmond. Further entertaining places for thrill seekers such as Aerial Extreme in Bedale and Adrenalin North Yorkshire are also available. This offer is based on a 3 Bed Lodge. The award-winning design, modern open plan living and sustainable build are only a few highlights of these superb residences. The huge expanse of glass allows the magnificence of the natural surroundings to be as much a part of the luxury experience as the exquisite attention to detail showcased in the interiors. 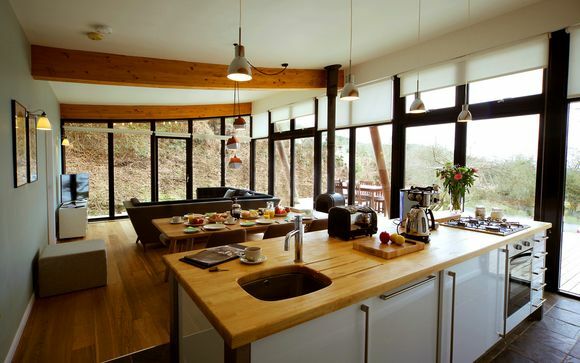 Having benefited from a complete refurbishment, the interior of each residence has been entirely revamped, incorporating ethical and exquisite design. 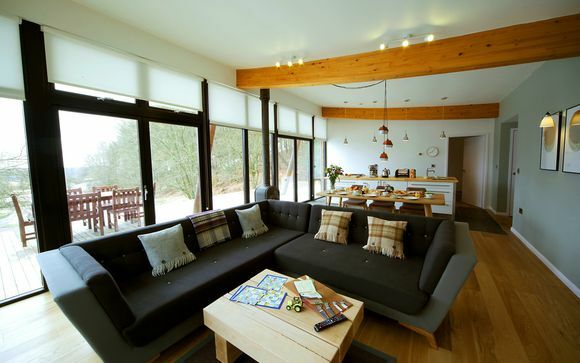 The lodges are lovingly furnished with bespoke touches such as the exclusively designed sofas and innovative 'cube' seats, showcasing colours purposely chosen to complement and mirror the idyllic scenery. Locally-sourced items have been used wherever possible, from the beautiful sofa cushions to the unusual 'tree trunk' bedside tables. Your fully-equipped kitchen features sophisticated wooden surfaces, sleek cabinets and top quality Dualit appliances. With a gas cooker, coffee machine and open plan environment, let the well-designed space and the wealth of kitchen tools available inspire you to create wonderful dishes for your loved ones. There are plenty of activities to keep you occupied and entertained during your Yorkshire Dales break. Mountain bikes can be hired and there are many riding stables in the area. Fantastic fishing can be found on the Swale as close as Richmond itself and there are endless miles of exhilarating walks across the Dales. You can hire your own personal trainer and outdoor fitness guru during your stay and have your very own fitness retreat designed for you and your group of friends or family. You'll undertake an inspiring and invigorating fitness programme exclusive to this stunning location. Treat yourself to a luxurious and truly indulgent beauty therapy service - 5 star quality organic treatments carried out in the comfort of your accommodation. Caving, canoeing, fishing, golf, gliding, or mountain biking - however you like to spend your days on holiday there are plenty of sports and activities to try in the Yorkshire Dales. It's a non-stop adventure! By Plane - The nearest major airports to Natural Retreats Yorkshire Dales are Leeds-Bradford and Newcastle which are served by more airlines than the nearer Durham Tees Valley airport. Car hire is available at both airports, and Natural Retreats customers are entitled to 10% off at Europcar. By Train - Darlington is the nearest train station to Natural Retreats Yorkshire Dales, approximately 13 miles down the road, and with train from many areas around the country, such as London Kings Cross, Newcastle, Edinburgh and Reading, making stops in Darlington it is very easily accessible. By Coach - National Express runs a service from London Victoria that arrives in Darlington as well as a Newcastle-upon-Thyne service. 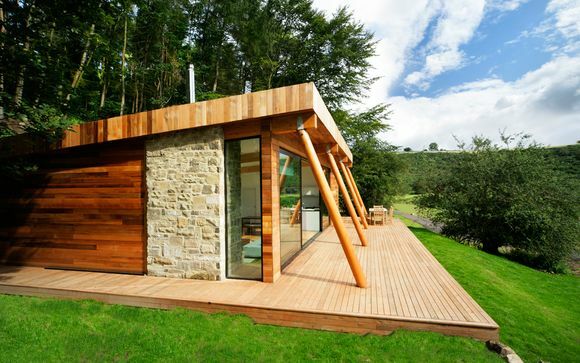 Darlington is only 22 minutes away from Natural Retreats Yorkshire Dales.